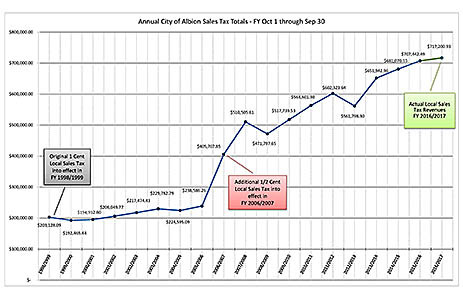 Albion sales tax trend chart for previous years. Albion city sales tax receipts had a slow start to the new fiscal year, with August 2017 receipts totaling about seven percent less than the same month a year earlier. August city sales tax receipts were $61,293, down $4,467 or about seven percent from the August 2016 total of $65,760. Last fiscal year (2016-17) had a much stronger start, with record August receipts. That total was about $9,400 more than August of the previous fiscal year. Motor vehicle sales taxes were stronger in August at $4,175, up from the July total of $2,832. All motor vehicle sales taxes are devoted to the city street fund.